How to use Gamification to Engage your Trainees. The most recent update to Axis LMS introduced a new concept to the system, commonly referred to as “Gamification”. This concept draws inspiration from what the gaming industry has been doing for years: giving their ‘players’ small threshold achievements. The real appeal of these achievements is that these small advances – the user always striving to unlock the next ‘thing’ – keeps your trainees engaged on to your system, increasing engagement. Inside Axis LMS, this is mirrored through a Talent system referred to as Badges. 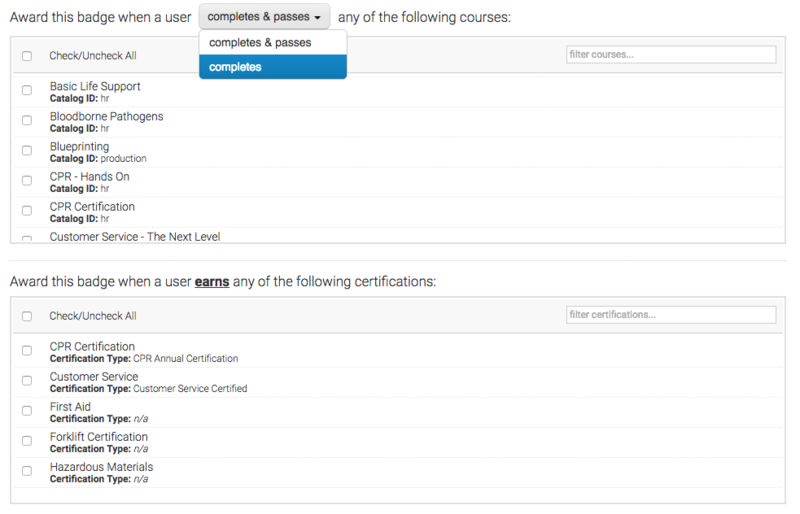 Through the use of Badges, you are able to award your users for completing Online Courses, earning Certifications, and achieving high scores … and by implementing Badges capable of being awarded by Event Triggers, you’re able to award Badges for other thresholds — such as passing a specific quiz, finishing a presentation, posting on UserConnect or Forums, and much more. Badges are one way that admins are able to make users taking their training into something slightly more competitive. This is a fun feature, targeting towards encouraging users to participate more in your system, and to climb the Badges Leaderboard. Badges can be awarded for doing just about anything in the system; it’s really up to the admin to decide what is badge worthy. As users accrue badges, they’ll be able to keep track of what badges are available, versus what they’ve already earned. To begin creating badges in Axis LMS, head to your Talent tab, and select Badges, then Manage Badges. If you’ve never created a badge before, you’ll be prompted to create one. Select Create a New Bade to open up the Badge Editor. The Badge Editor is broken into two different sections: Badge Settings, and how it’s awarded. The Badge Title is the name of the Badge throughout the entire Axis LMS. Users will see this Title when viewing their badges, and it will appear in your Badge listing by this title. The Badge Image is the image associated with this Badge. There are dozens of options available, but you are also able to upload your own custom badge images into your File -> images -> badges folder. The Badge Description is *usually* how the badge is earned; however, the Description can be whatever text you write into it. When users hover over badges inside UserConnect, the description will appear for them. 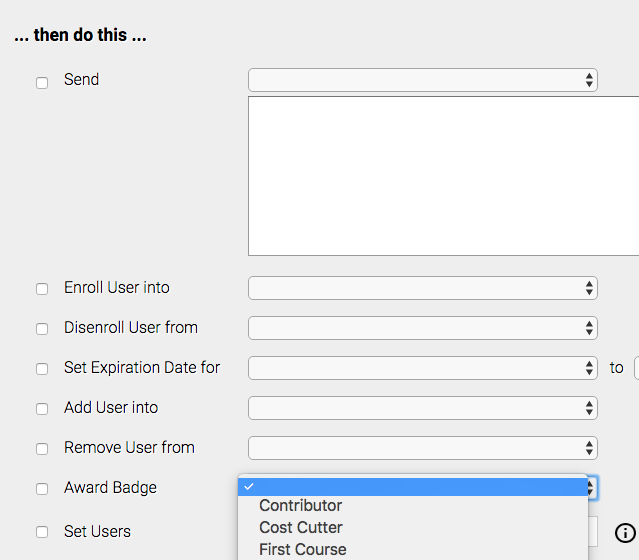 Badges can be awarded a countless number of ways in Axis LMS; when you’re inside the Badge Editor, you’re able to select a Course, Certification, Trigger, or Manual requirement. You can check one or more of the different methods; the first method triggered will award the Badge. A Course Requirement means that you’ve toggled one or more Courses that a user is able to complete to earn the badge. You may want to give each Course its own badge; in this case you’d toggle one Course to the badge. But if you want to create a “complete your first course” badge, checking all the Courses will award the badge as soon as any of the toggled courses is completed. The Certification Requirement awards a badge to the User as soon as they’ve earned the selected Certification. If each certification is tied to one badge, running reports on who has a certain badge can give you an idea of every user who has ever completed a certification. Trigger Requirements are without equal the most versatile way to award Certifications. With a criteria ranging from Usergroups, to days of the week, to number of days in a particular Course; awarding Badges based on Event Triggers gives you the most control over Badge distribution. Manual Badge Assignment means that this Badge is able to be awarded at a Manager, Sub-Admin, or Admin’s own discretion. If this option is not checked, this badge cannot be given to any users – they need to earn it via a Course, Certification, or Trigger Requirement. 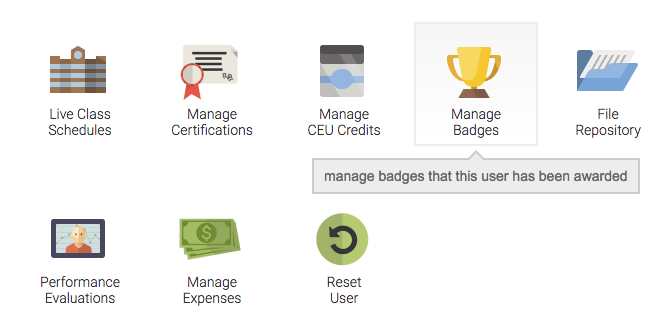 To manually assign a Badge to a user, select them from the Manage Users screen, then Manage their Badges. From here you can select what badges you want to award to the user (you can remove badges from a user here as well). After you’ve created one or more Badges, you’re able to Edit the Badge, Remove the Badge, or pull up reports on who has earned a certain badge. It’s important to note that because Badges can be manually assigned or removed from users, this report might not carry as much weight, or be as accurate as running a Course or Certification Report. As with all Reports, Badge reports can be exported, printed, or filtered. While a User is inside of UserConnect, they’re able to quickly access a Badges Leaderboard from their toolbar on the left. This will bring up a list of the top Badge earners in the system, in terms of the total number of badges earned. Users can then send connection requests so that they appear in the user’s connections. This entry was posted on Wednesday, April 26th, 2017 at 9:04 pm	and is filed under ELearning 101. Responses are currently closed, but you can trackback from your own site.